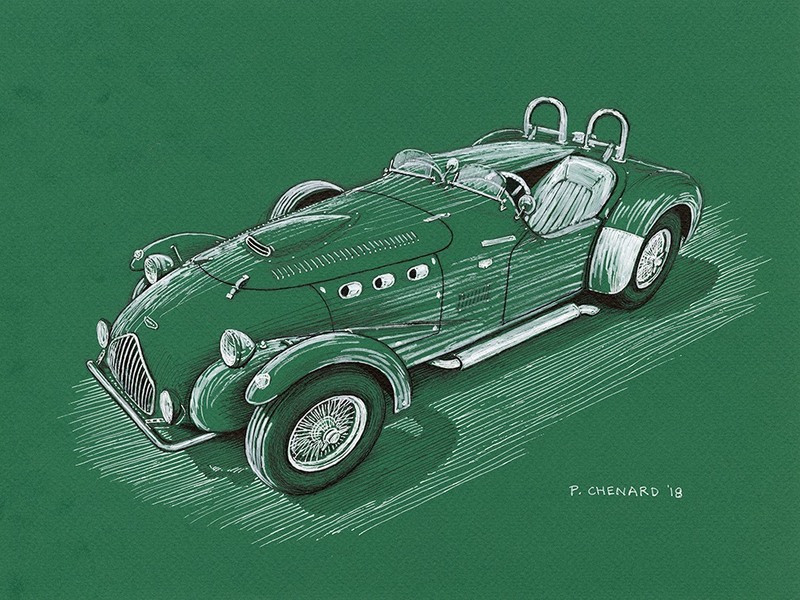 Automobiliart by Paul Chenard and Drive Toward a Cure have teamed up to help put an end to Parkinson’s Disease. 35% of all sales made through drivetowardacure.org will benefit Drive Toward a Cure in our mission to support Parkinson’s Disease research and patient care. 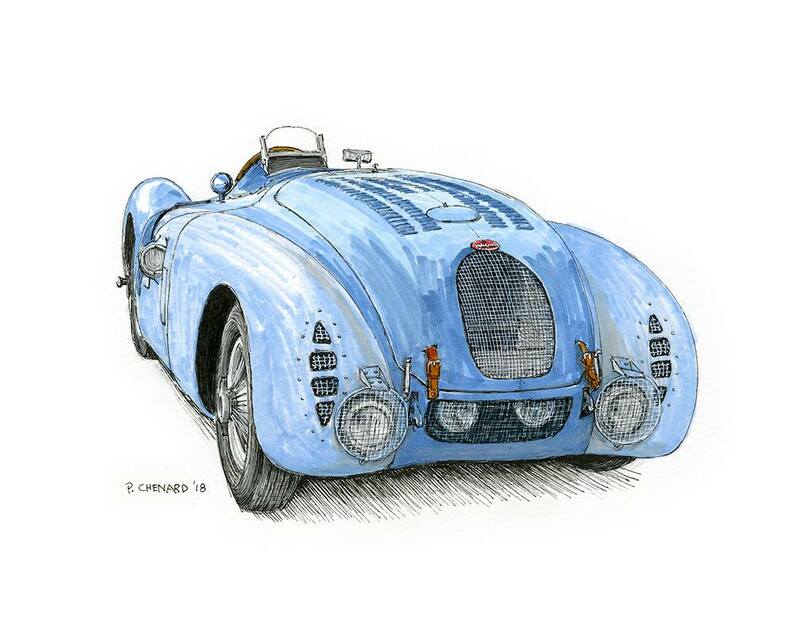 For the past decade Paul Chenard has been contributing his artwork to raise funds for Parkinson’s Disease as a result of the friendship between Paul and Drive Toward a Cure founder, Deb Pollack, and we couldn’t be more proud of our relationship, and his fine works of art. 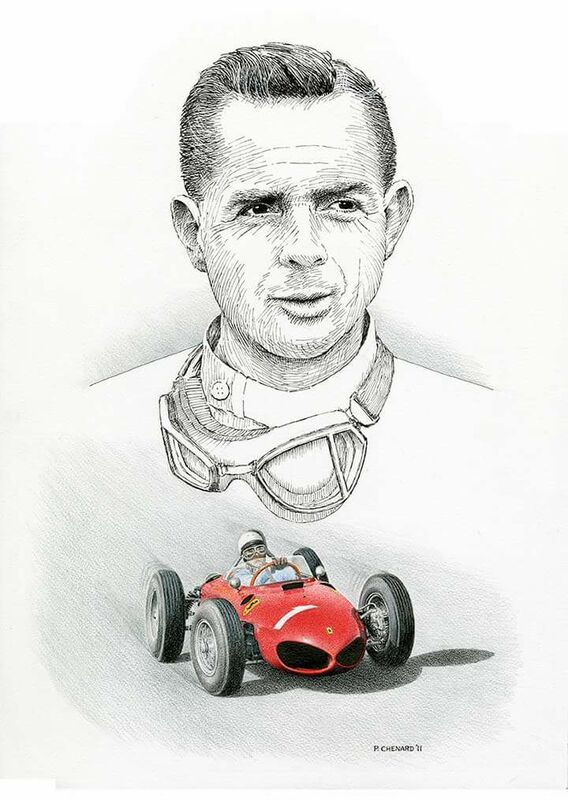 Our relationship with renowned illustrator Paul Chenard began thanks to our mutual friendship with Denise McCluggage and grew with caring thoughts and memories of gentleman driver Phil Hill. 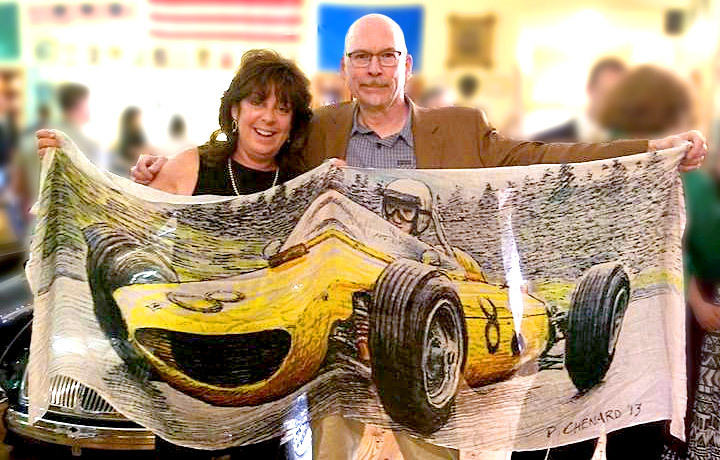 The first piece donated in support of Parkinson’s Disease featured Phil Hill and his Formula 1 Championship-winning 1961 Ferrari 156 F1. 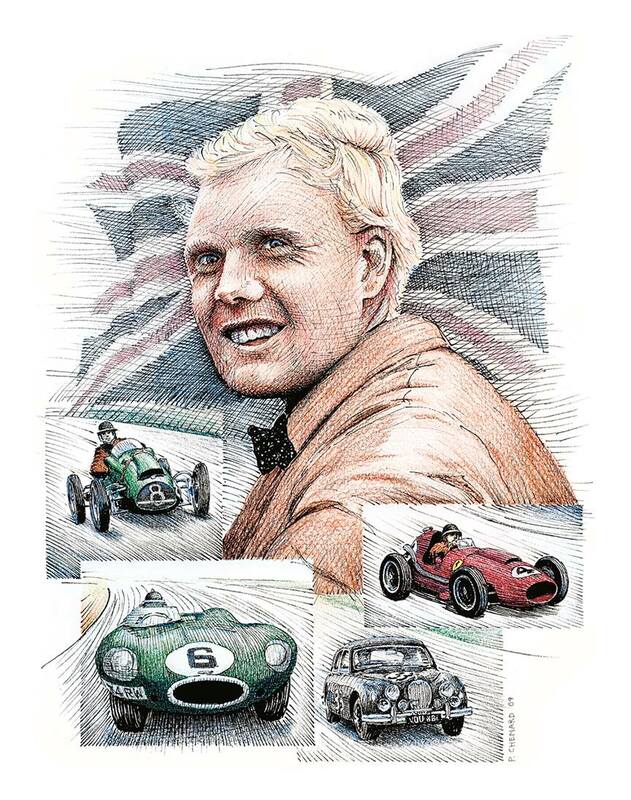 We’re honored that Paul’s artwork is featured in our “Spirit of Drive Toward a Cure” awards. Purchase Paintings and Illustrations to support Drive Toward a Cure! All figures are in US dollars. Premium shipping rates: Small (S) item is $30 to USA/Canada, $36 overseas; Medium (M) item is $45 to USA/Canada, $54 overseas; Large (L) item is $60 to USA/Canada, $80 overseas. Shipments are insured and traceable. For multiple items purchased together, the shipping price for the largest item will apply and each additional item will be charged just 25% of the listed shipping rate. Items are unframed. Purchases will be shipped from Canada. Any customs/duties applied on import are the sole responsibility of the purchaser. All reasonable efforts will be made to ensure current availability is reflected on DriveTowardaCure.org. In the case that an item has been sold directly by the artist, a full and complete refund will be issued. 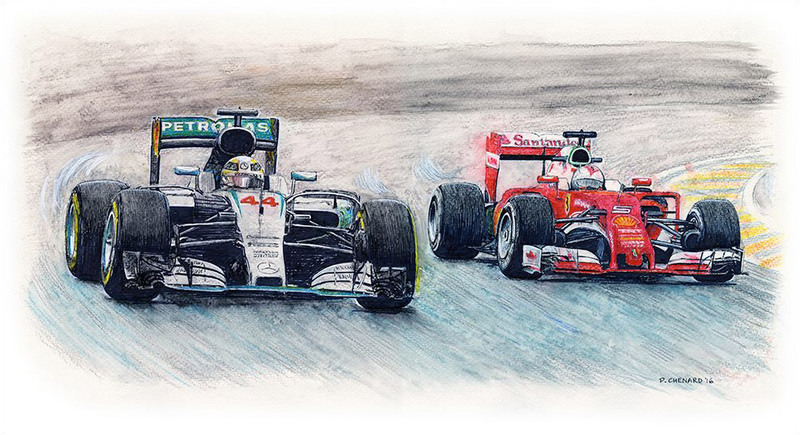 Lewis Hamilton racing the Mercedes AMG Petronas W07 Hybrid against Sebastian Vettel in the Ferrari SF16-H. Pen & ink, watercolour, acrylic and colour pencils on watercolour paper. © Paul Chenard 2016. $700 USD plus shipping/fees (L). Approximately 35% of the sale price will benefit Drive Toward a Cure! Pencil, pen & ink, markers and Jack Daniels Honey Whiskey on 15″ x 10″ watercolour paper. © Paul Chenard 2016. $250 USD plus shipping/fees (M). Mark Donohue cresting the hill in the esses at Mid-Ohio 1973 in the Penske Sunoco Porsche 917/30. Acrylic on 100cm X 50cm (39.4″x19.7″) canvas. © Paul Chenard 2016. $1,200 USD plus shipping/fees (L). 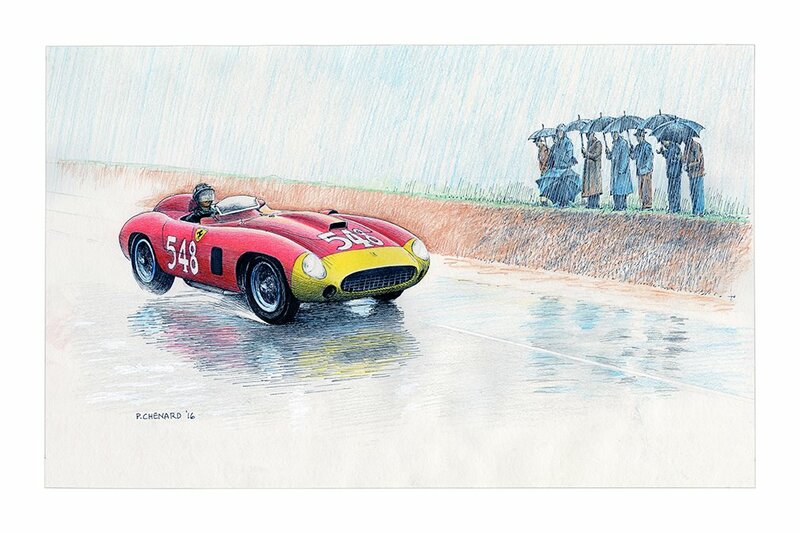 Eugenio Castellotti (1930-1957) racing the Scuderia Ferrari 290 MM Scaglietti chassis #0616 to a win of the rainy 1956 Mille Miglia. Pen & Ink, watercolour pencils and acrylic pens on 18″x12″ watercolour paper. © Paul Chenard 2016. $550 USD plus shipping/fees (M). Sketched live at the 2016 Race Retro. Pencil, pen & ink, and Jack Daniels Honey Whiskey on 12″x9″ watercolour paper. © Paul Chenard 2016. $300 USD plus shipping/fees (S). 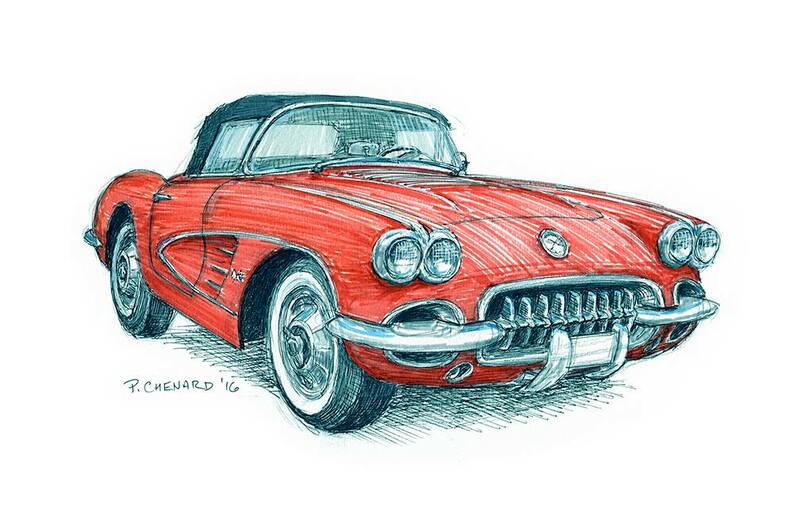 Sketched live at the 2016 London Classic Car Show. Pen & ink, markers and Jack Daniels Honey Whiskey on 11.5″x9″ watercolour paper. © Paul Chenard 2016. $350 USD plus shipping/fees (S). 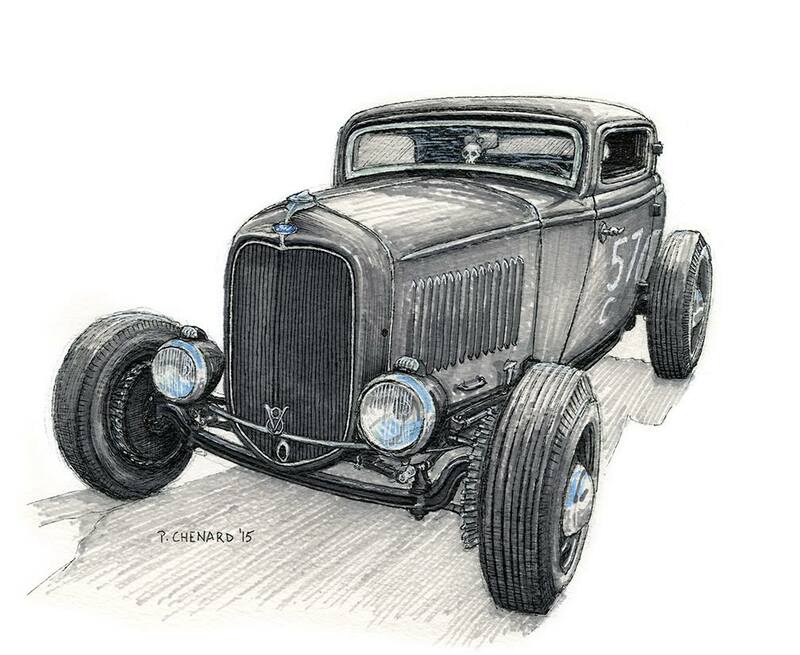 Sketched live at the Sywell Classic Pistons & Props. This car just says “Get out of the way” so elegantly! Pencil, pen & ink, markers and Jack Daniels Honey Whiskey on 12″x 9″ watercolour paper. 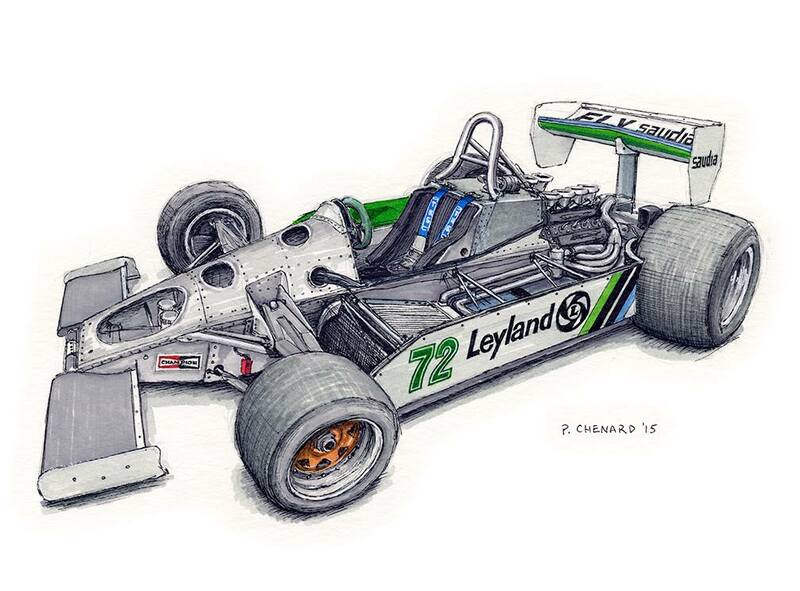 © Paul Chenard 2015. 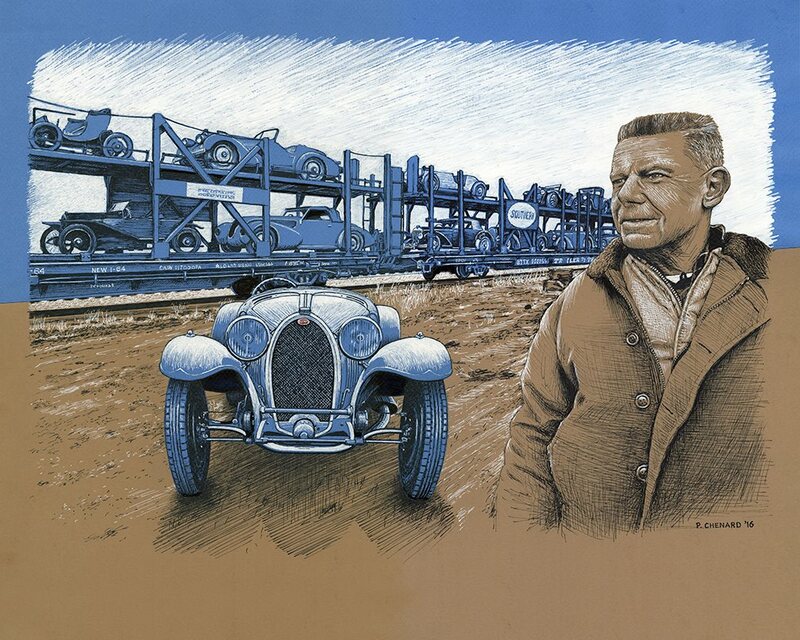 This art-piece was produced for a VeloceToday feature on Shakespeare’s sale of his 30 Bugattis to the Mulhouse museum in 1964. These are 3 separate illustrations glued together; 2 on blue paper and one on brown paper. Black and white markers, with a touch of red. Final size 19.75″x14.75″. © Paul Chenard 2016. $550 USD plus shipping/fees (L). 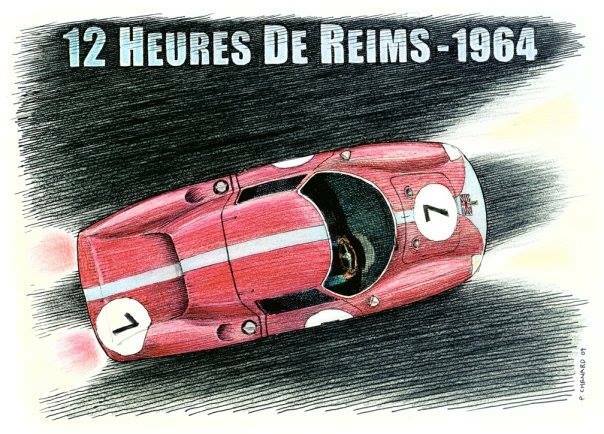 Sketched at the Spa Historic 6 Hours. Pencil, pen & ink, markers on 12″x9″ watercolour paper. 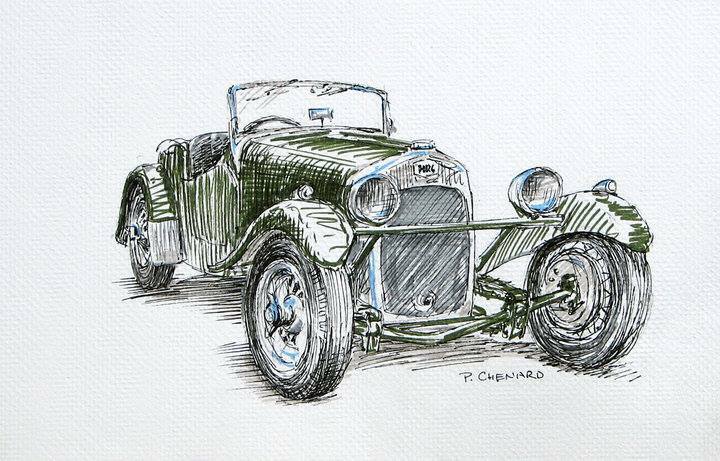 © Paul Chenard 2015. 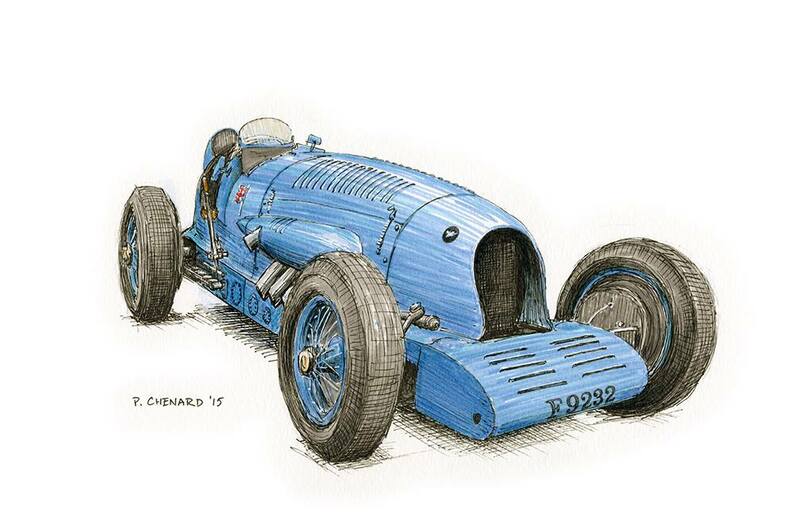 Blue Bird recreation sketched at the Brooklands Reunion. Pen & ink, markers, toxic fumes/exhaust flames, and Jack Daniels Honey Whiskey on 12″x8″ watercolour paper. © Paul Chenard 2015. Pen & ink with watercolor pencil wash and Prismacolor Pencils, 12″x 9″. © Paul Chenard 2009. $500 USD plus shipping/fees (S). 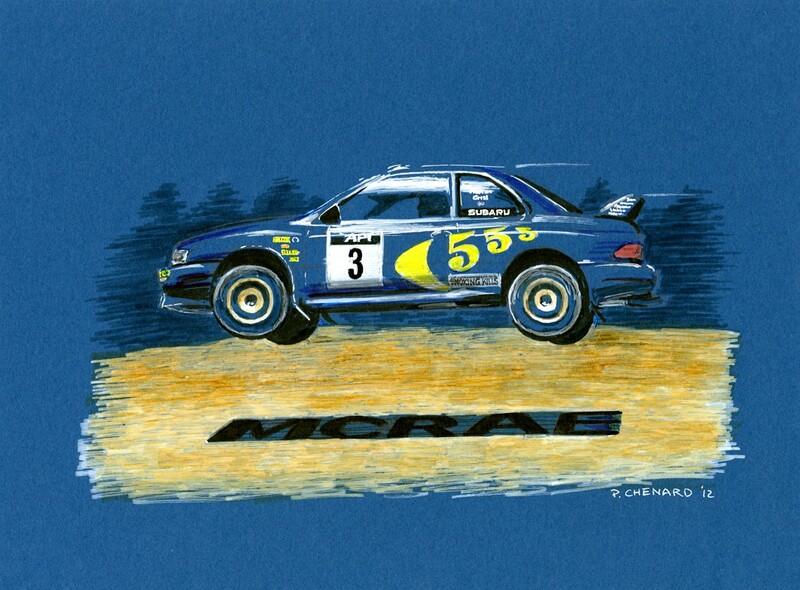 Scottish rally legend Colin McRae flying his Subaru “555” Impreza at the 1998 Rally Australia, his final year with Subaru. Pen & ink, paint markers and markers on 12″x9″ (30.5cm x 23cm) blue archival stock. 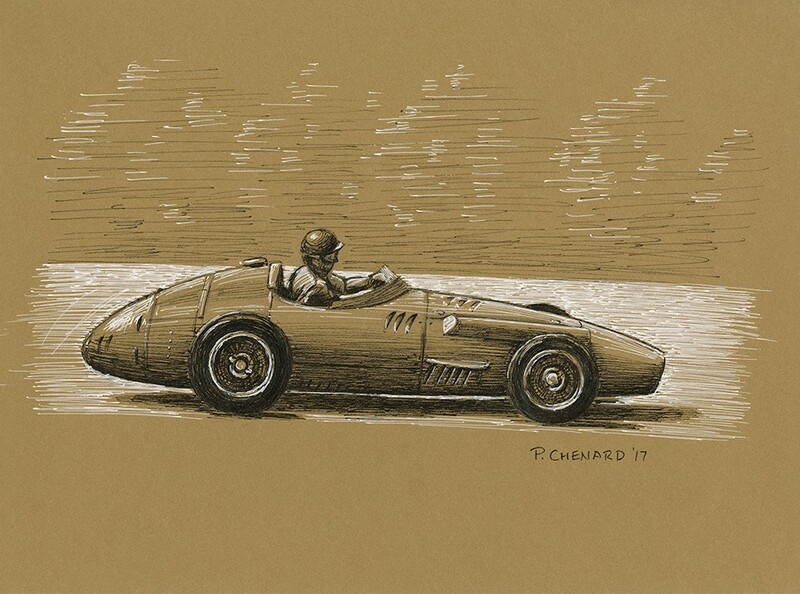 © Paul Chenard 2012. $250 USD plus shipping/fees (S). Very rare, one of 16 made of this model. Illustrated during the British Motoring Festival on July 24th 2010 in Windsor, Nova Scotia. Pen & ink and markers on 12″x9″ white archival stock. © Paul Chenard 2010. $100 USD plus shipping/fees (S). 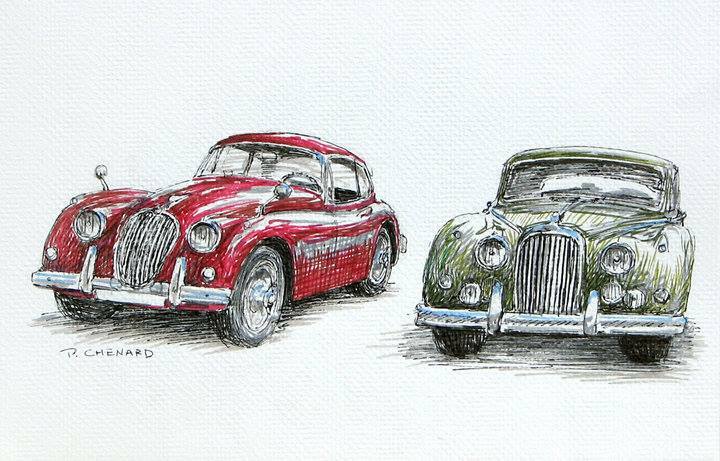 Jaguar XK150 & Mark IX. Illustrated during the British Motoring Festival on July 24th 2010 in Windsor, Nova Scotia. Pen & ink and markers on 12″x9″ white archival stock. © Paul Chenard 2010. 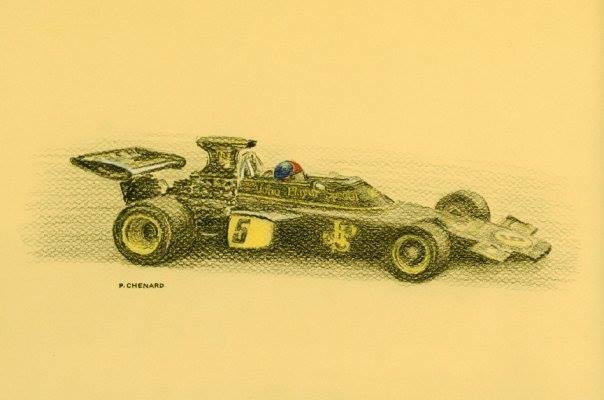 Emerson Fittipaldi capture his first F1 World Championship in 1972 driving the John Player Special (a Lotus 72). 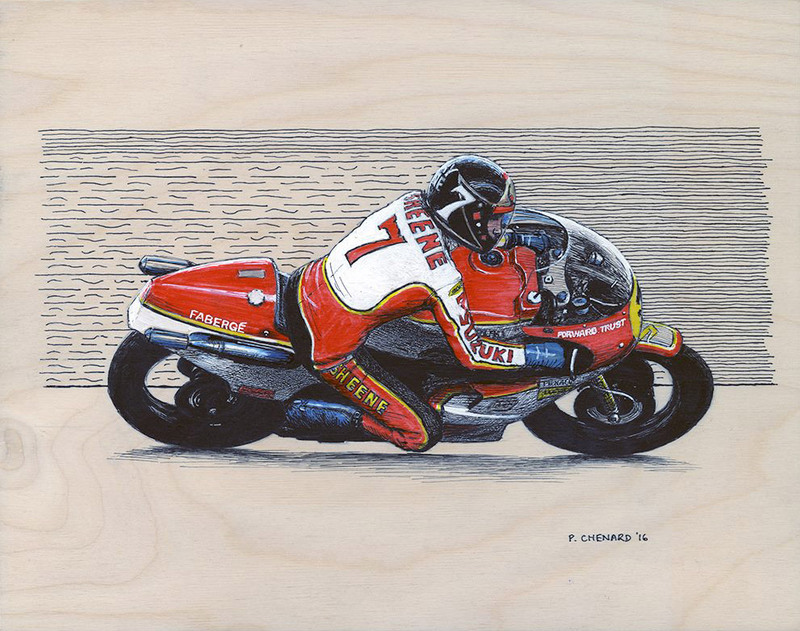 Coloured pencils on 12″x9″ cream-coloured archival stock. © Paul Chenard 2010. Graham Hill – Maranello Concessionaires Ferrari 250LM. 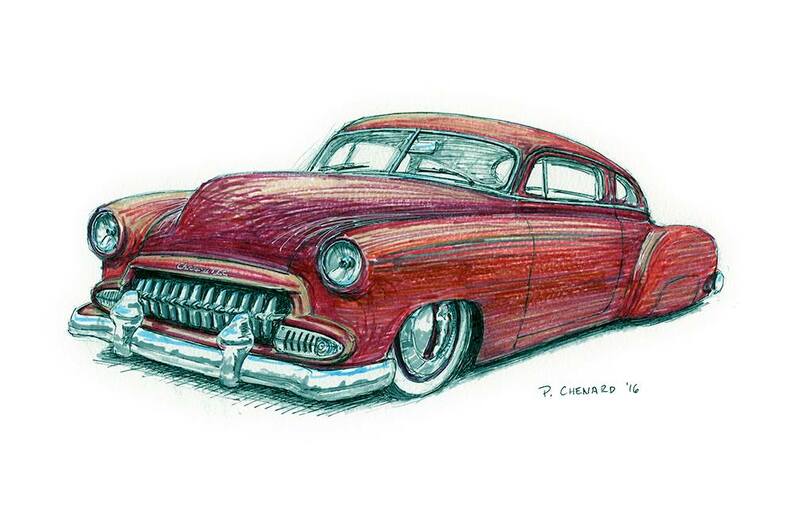 Pen & ink and Prismacolor pencils on white archival stock 12″x9″. © Paul Chenard 2009. $125 USD plus shipping/fees (S). Pen & ink and markers on 14″x11″ (35.5cm x 28cm) birch panel. © Paul Chenard 2016. Black pen & ink and white acrylic pens on 12″x9″ (30.5cm x 22.8cm) medium brown cotton stock. © Paul Chenard 2017. $225 USD plus shipping/fees (S). 1996 Championship-winning F1 car. 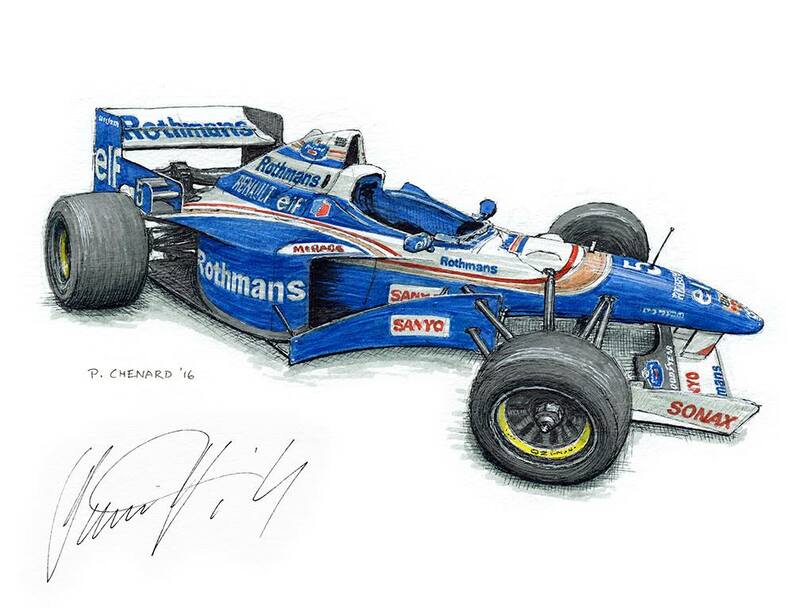 Autographed by Damon Hill OBE. 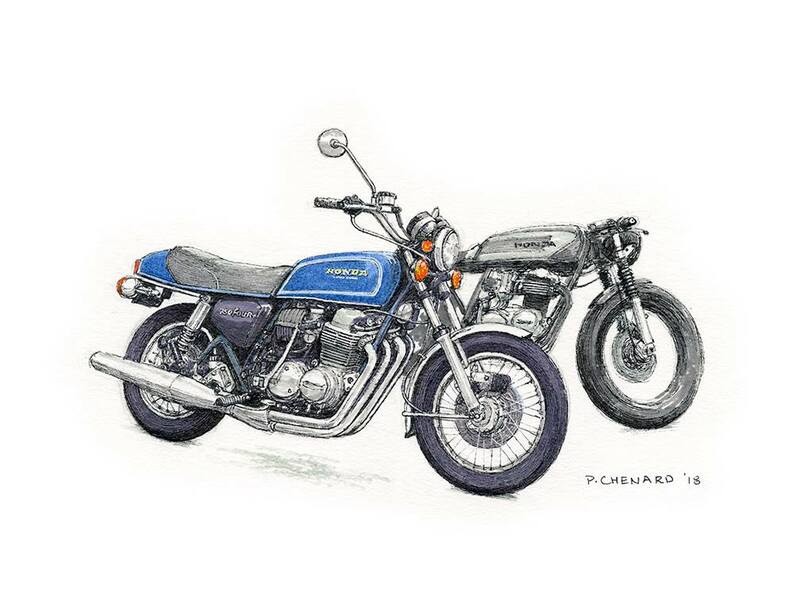 Sketched live at the 2016 Race Retro. Pencil, pen & ink and Jack Daniels Honey Whiskey on 12″x9″ watercolour paper. © Paul Chenard 2016. $650 USD plus shipping/fees (S). Alberto Ascari finding out that he is in the lead at Mantova during the 1954 Mille Miglia, which he won racing the Lancia D24. Black and white pen & ink on 12″x9″ (30.5cm x 22.8cm) brown stock. © Paul Chenard 2018. James Hunt racing the McLaren M23 to a win of the 1976 German Grand Prix. Pen & ink and markers on 12″x9″ watercolour paper. © Paul Chenard 2017. $175 USD plus shipping/fees (S). 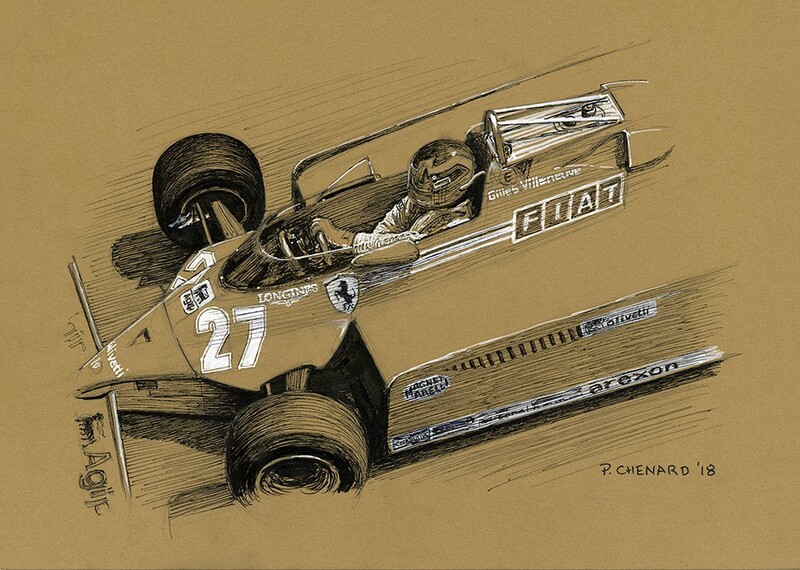 Gilles Villeneuve man-handles his Ferrari 126CK to a win of the 1981 Spanish Grand Prix. The brilliance of that drive cannot be underestimated. Black and white pen & ink on 12″x8.5″ (30.5cm x 21.6cm) brown archival stock. © Paul Chenard 2018. Nick Lowe’s 1976 Honda CB750 Four Super Sport in the foreground, Jason Keddy’s custom Honda CB550 in the background. Live-sketched at the Chicken Burger bike gathering and finished at home. Pencil, pen & ink and markers on 11.5″x8.5″ watercolour paper. © Paul Chenard 2018. 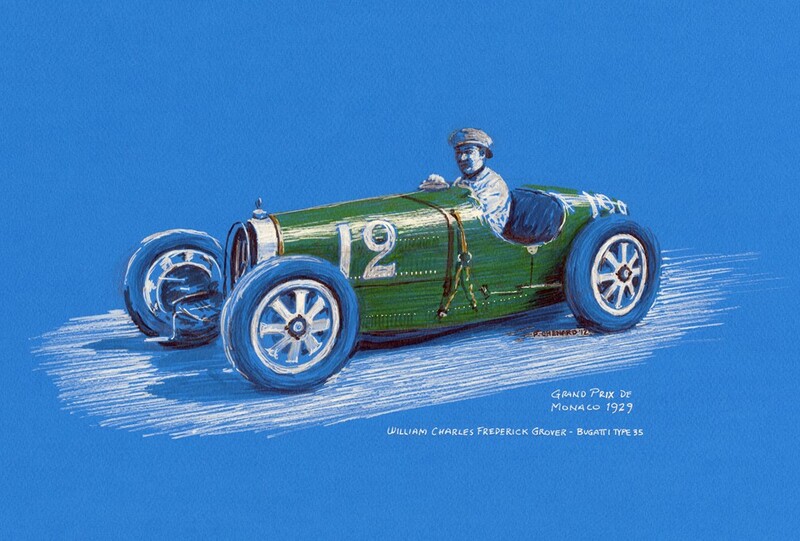 “Williams”, winner of the very first Grand Prix de Monaco in 1929, driving a Bugatti Type 35B. Pen & ink, paint markers and markers on 18″x 12.75″ (45.5cm x 32.5cm) blue archival paper. 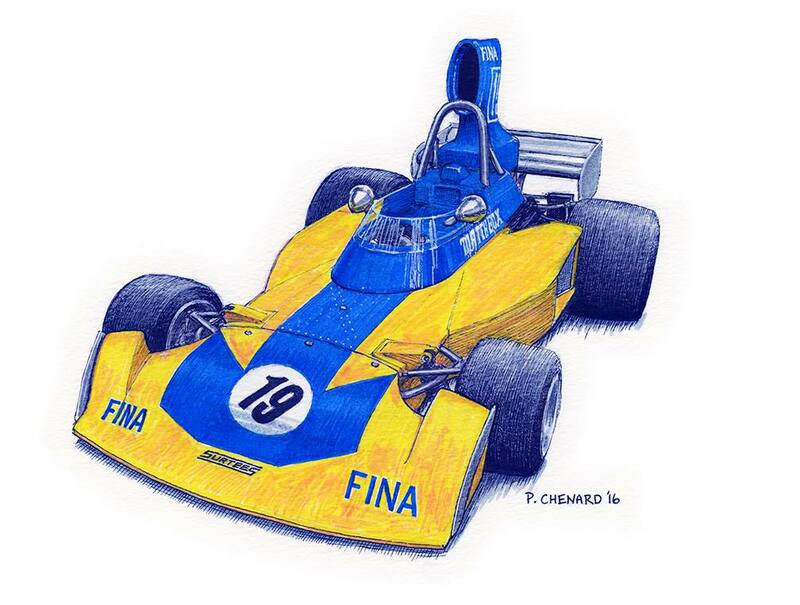 Production note: there is no green marker in this illustration – only yellow on the blue paper. 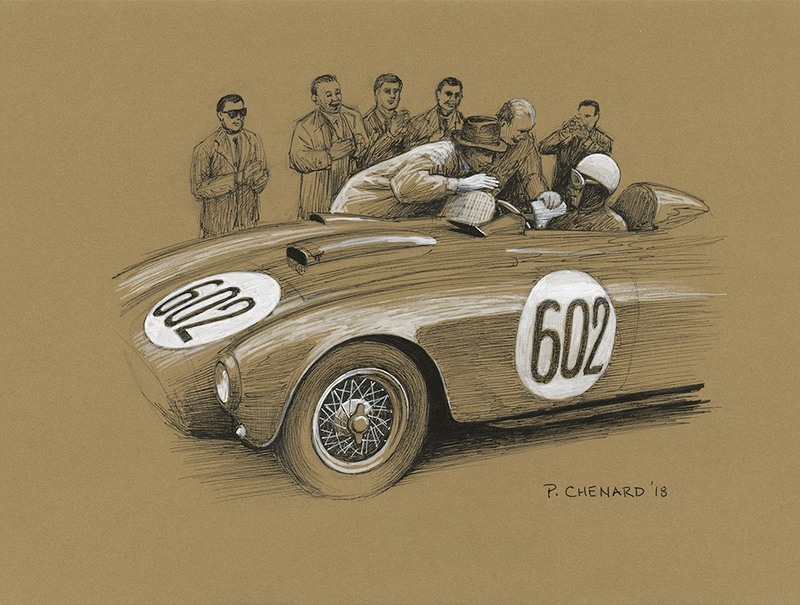 © Paul Chenard 2012. $350 USD plus shipping/fees (M). This car is from the Simeone Museum collection and won the 1937 24 heures du Mans. 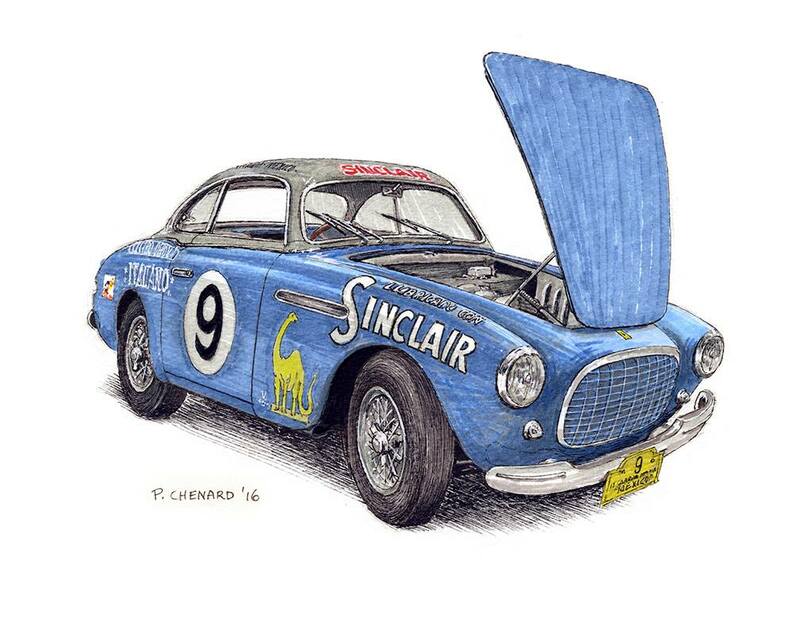 Live-sketched at the Lime Rock Historic Festival. Pencil, pen & ink, markers and Jack Daniels Honey Whiskey on 11.5″x9″ watercolour paper. © Paul Chenard 2018. $400 USD plus shipping/fees (S). Black and white pens on 12″x9″ (30.5cm x 22.8cm) green paper. © Paul Chenard 2018. Ayrton Senna won his 1st of 3 Formula 1 Championships racing the McLaren MP4/4. 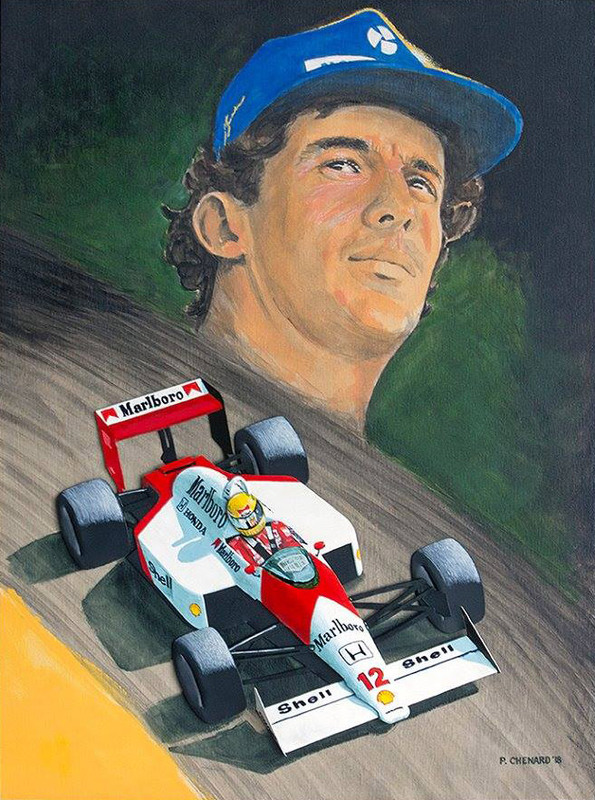 Senna portrait: acrylic on 18″x24″ (45.7cm x 60.9cm) birch panel. McLaren MP4/4: acrylic and markers on 8 separate hand-cut pieces of aluminum sheet, approximately 1.25cm in depth, bolted to the birch panel. © Paul Chenard 2018. $3,500 USD plus shipping/fees (L). The 1967 German Grand Prix took place at the (in)famous Nurburgring, with Denny Hulme winning the race at the wheel of the Brabham-Repco BT24. Here he negotiates the Hatzenbach section. 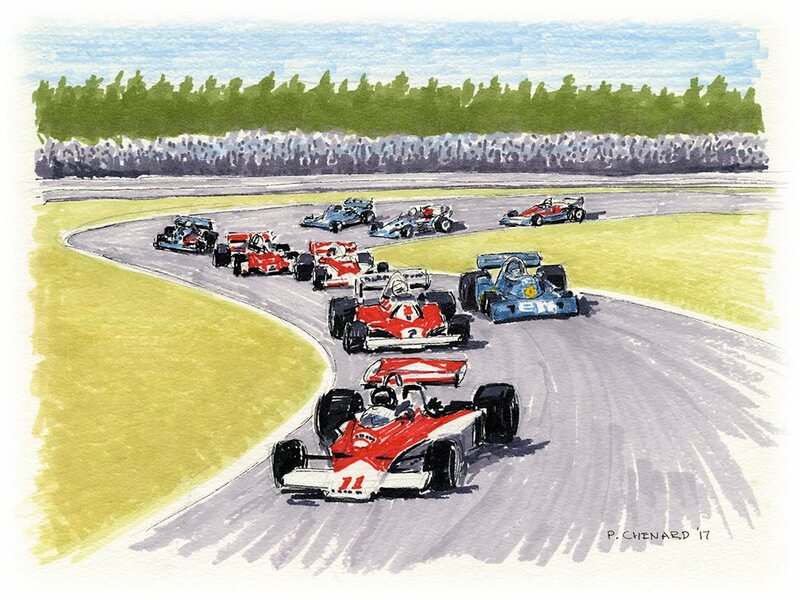 At the time, the track was over 14 miles long, with 160 turns, mostly through the woods, with little or no run-off. The extreme challenge and danger of racing there lead to Jackie Stewart calling it the Green Hell, a name that has stuck. Acrylic brush and palette knife on 24″x48″ (60.9cm x 121.9cm) birch panel. Based on a photo by Geoff Goddard. © Paul Chenard 2018. $1,500 USD plus shipping/fees (L). Juan Manuel Fangio leads Stirling Moss, Piero Taruffi and Karl Kling on the Monza banking at 1955 Italian Grand Prix, racing the stunning Mercedes W196 STR. Acrylic on 6″x 24″ (15.2cm x 60.9cm) birch panel. Silver paint used for the cars. © Paul Chenard 2018. $600 USD plus shipping/fees (M).